Greed Master Net PO 15 trades by RSI signals. Trades are performed in an appropriate direction when the indicator reaches the value of 30 or 70. If the indicator exceeds 70, Short direction is selected for initial trades. If the indicator falls below 30, Long one is selected. Profitable trades are closed by take profit. Loss-making ones are averaged by the EA. An order grid is created in the same direction, a breakeven level is calculated, and the grid is closed by take profit when the price reaches it. Hours_to_GMT_Offset - known server time shift hours (GMT). Hours - if true the EA trades with a specified Begin_hour parameter (GMT) up to End_hour (GMT). If false, the EA trades constantly. LotStop – lot limitation from the MinLot to MaxLot for the selected account. Limits the growth of the lot size for the initial trades in a grid, which is performed depending on the deposit and the value of the MaximumRisk parameter. When the LotStop value is reached, the initial trades in a grid will maintain this lot size. LotForManual – initial lot size value for trades that will be placed manually. During the EA operation this parameter can be changed using the special buttons in the EA toolbox. OnOffUnLine - if true, the mode of uneven averaging grid step increase is activated. LotMax - limitation of maximum lot, that can be used by the EA when plotting grids. BW – color correction for the 'black&white' window mode. DelObj – if true, all objects of the EA are deleted from the chart when the EA is deleted. TrailingStop and TrailingStep - trailing parameters. These parameters allow you to set Greed Master Net PO 15 into different modes according to your objectives. 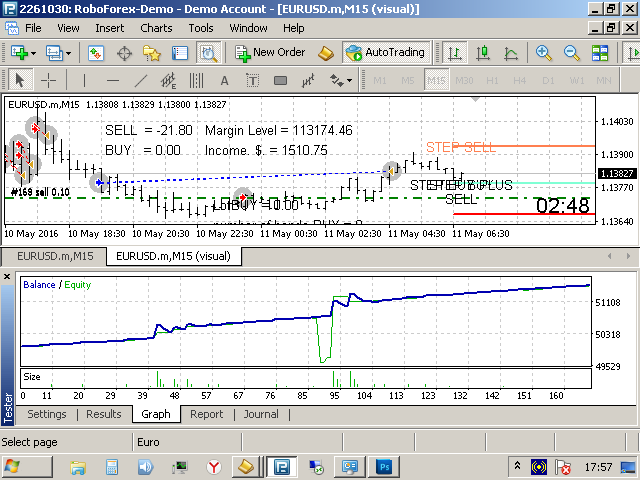 The default parameters are configured for EURUSD M15 and considered moderately aggressive. Added several restrictions and settings and the customers' request. 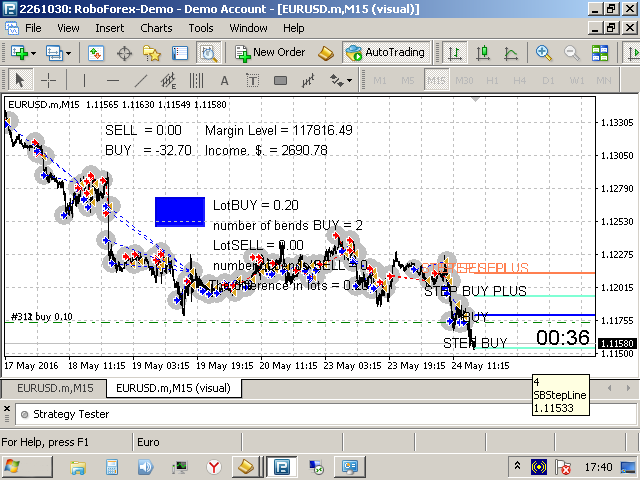 AxelOption - enable/disable the drawdown limiting mode. CloseDeals - delete the deals. NumbLot - the number of significant digits after the decimal point. This is for stocks, commodities and indices, there is NumbLot = 1 (lot Step = 0.1). - Added buttons for pending orders. Press the "Pending order" button. A yellow line appears, its location indicates the price. After that, press the button of the corresponding order. Its lot size is preselected on a special panel. The future order is checked for lack of funds for this lot size. - Fixed a bug in calculation of the daily earnings. There was a limit of one thousand orders. The EA terminated once the maximum was reached. Now there is no limit. - Added buttons for calculating the lot sizes of trades for changing locations of the breakeven and profit prices, blue and red lines. It looks as follows. Press the "Move Blue" or "Move Red" button. A line with the corresponding color appears. While approaching to the Bid or Ask price, the lot size is displayed above the line. This is the lot size required for opening a trade at the current price for the breakeven and profit lines to be at the location of the moved line. The color of the number indicates that a trade cannot be opened starting from a certain location due to insufficient funds. Added button Info Button. Information about the account and the Symbol. Added information about the profit per day. 1. Added the ability to use a minimum lot of 0.01. In version v 1.0, when reducing the MaximumRisk parameter, a lot size of 0.1 was set as minimal for the initial trades. In version v1.1, when the MaximumRisk is reduced, it is now possible to set a lot of 0.01 as the minimum lot for the initial trades. 2. Added the LotStop parameter. At any value of the MaximumRisk parameter, the lot size of the initial trades will not exceed the value specified in the LotStop parameter. What limits the size of the initial lot based on the deposit size. 3. Fixed the incorrect calculation of the server time offset to GMT time. 4. Added a block for manual trade placement, manual lot setting, the LotForManual parameter in the settings is the initial lot size for manual trades. And the Locking button, when pressed it calculates the difference in lots according to the directions and places a trade for lot parity.